Caption: Seniors create ceramic tiles with artist Jennifer Wade. Since April, seniors at two senior centers in Coney Island, JASA Senior Alliance and the Coney Island Seaside Innovative Senior Center, have been creating ceramic tiles inspired by the ocean and their community. 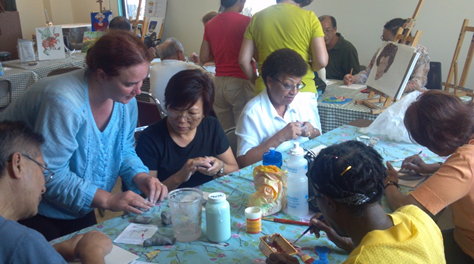 During weekly two-hour workshops led by artist Jennifer Wade, participants have explored the art of clay-making. They first worked together to determine a theme for their public mural installation, which incorporates tiles from both sites, and decided to focus on the lasting impact of Superstorm Sandy on their community. The project will be installed on a relic fountain on the Coney Island boardwalk at 21st Street as part of the ongoing community renewal effort after the storm. As a resident of the Seagate community who was profoundly impacted by the storm, Jennifer Wade is deeply committed to renewal. Her husband Patrick Denis is also involved as the installer of the final work. The couple’s passion for the project is infectious. We are thrilled to see the benefits of the creative process and excited to celebrate the seniors’ work at the public unveiling on October 29.